Climbing vines add height, texture, color and even romance to your backyard. Climbers, particularly flowering types, make a great addition to your garden if you have a fence or trellis for them to clamber over. A favorite perennial garden climber is clematis (shown below), with many varieties boasting stunning flowers. Annual vines such as morning glory, sweet peas, and hyacinth bean – which has purple flowers followed by purple pods – are easy to grow. They can also fill out your trellis until slower-growing perennial vines get established. One of the most useful traits of climbers is their ability to screen the stuff you’d rather not see, like your compost pile, chain link fence, or a neighbor’s ugly shed. Trellises, arbors, pergolas, rustic willow or wrought iron supports, fences or other structures for supporting vines add a sense of style and give your garden an upright focal point. Just remember to make sure your support is sturdy enough, and that it harmonizes with your house and garden design. Vines either twine around support structures, or hold fast to upright surfaces. For example, wisteria weaves or twines, while climbing hydrangea and English or Boston ivy attach to walls with aerial roots or adhesive pads. 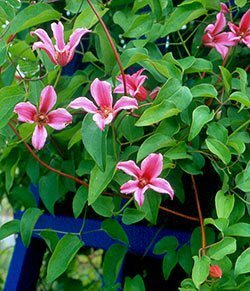 Then there are climbers that clasp with tendrils or petioles, such as clematis, or those with thorns that hook onto supports, such as climbing roses. As with all garden plants, take time to choose the right vine for your setting – sun lovers in sun, shady characters in shade, and rich, moist soil for a vine that requires it.